Mezzotint of Charles II as king. Bust length, lifesized with wig, lace cravat and brocade coat. Within an oval border and with Latin inscription below. Borders trimmed. Rare, a very fine impression. 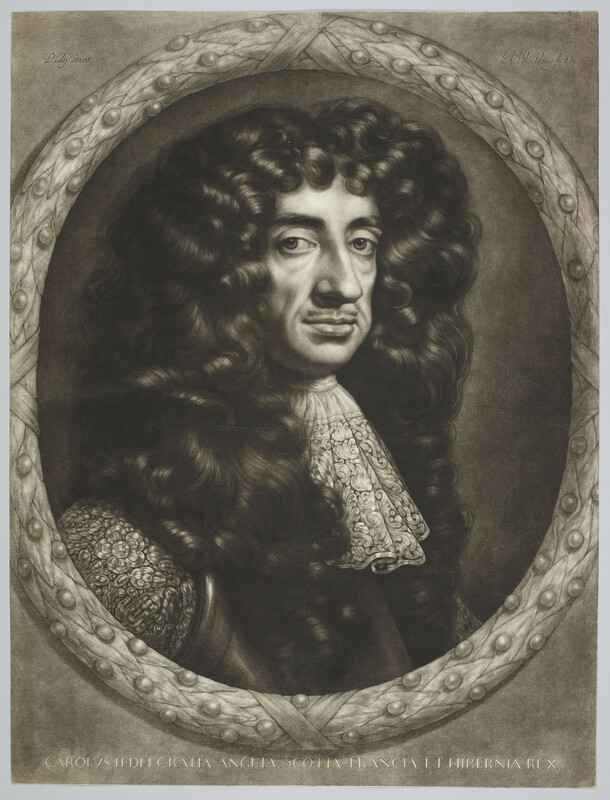 This is one of a series of three life-sized mezzotints by Blooteling after paintings by Lely, of Charles II, his brother the Duke of York (later James II), and his son the Duke of Monmouth. The production of such large plates would have been a major undertaking, and they were perhaps prompted, in a spirit of competition, by similarly large engravings of the king by Peter Vandrebanc published in 1675 and 1676. It is therefore puzzling that only a few impressions of each of the mezzotints survive, in a variety of states.